Can You Store Wine in the Refrigerator? It's general knowledge that the best place to store wine is in a cool, dark environment. In theory, your kitchen refrigerator fits that description. The appliance is also conveniently located in your home where you're prepping food and storing glassware, so it seems like a good choice. But is it okay to store wine in the fridge? This is a fairly frequent question and your wine will be fine in the refrigerator for a couple of days. In the long-term, however, there are a few reasons why it is not the most sensible place to stash your favorite bottles. No matter how logical storing wine in the refrigerator may seem, the short answer is an emphatic, "No." A typical household refrigerator does not provide optimum conditions for storing wine for more than one or two days. The common kitchen refrigerator maintains a chilly 35 F to 38 F temperature, with relatively low levels of humidity in the 30 percent range. Optimum temperatures for storing wine range from 45 F to 60 F, with ideal levels of humidity hovering around 70 percent to 90 percent. You can see that the numbers simply don't match. Furthermore, wines need to be kept free from excessive vibration. That hefty motor that runs around the clock in your kitchen refrigerator is a source of constant vino vibration. The next logical step for any wine lover is to consider wine refrigeration units. They range in size, from compact units that hold just a few bottles to larger ones that can store a few dozen. You also have the option of installing one in the kitchen or home bar or placing it out of the way in a basement or similar location. In most respects, wine refrigerators offer the environment for proper wine storage. They are designed to maintain ideal temperatures specific for storing wine, in the 45 F to 60 F range. Additionally, the design is meant to minimize vibration while holding the wines sideways in a cool, dark environment. If you already have a wine fridge that doesn't control humidity, you can work around that. Purchasing a hygrometer will allow you to measure the relative humidity in the unit. For readings below 50 percent, you can increase the humidity by placing a damp sponge on a tray or a small container of water in the refrigerator. Give your evaporation source about 24 hours to work, then read the humidity again. Remember that humidity doesn't change immediately. Each time you make adjustments, wait a full day to see your results. Also, adding too much humidity to the enclosed space can make wine labels begin to peel, so it's best to go slow. 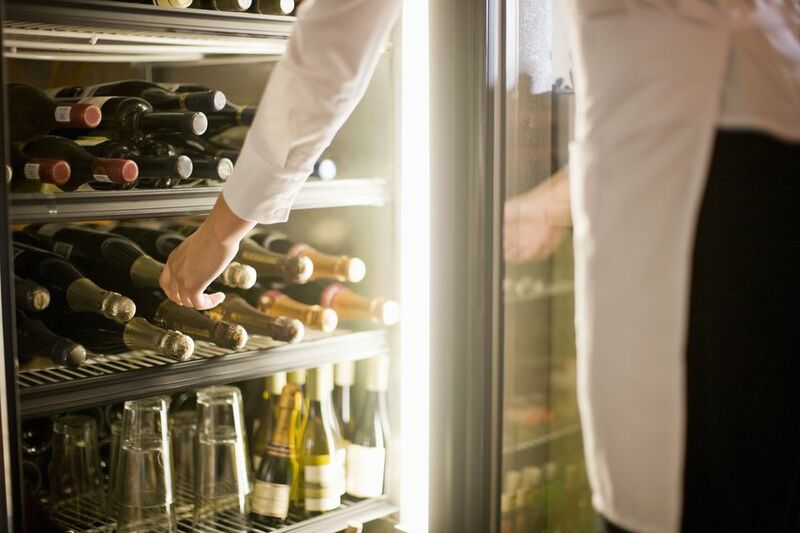 While normal refrigerators do not provide an optimum environment for storing wine in the long-term, you don't have to invest in a fancy cellar to get the job done. Just remember to keep your wine cool, keep it dark, keep it still, and keep it sideways (particularly for natural cork closures). If you can add some humidity and maintain consistent temperatures, then you'll have most of your wine storage bases covered.